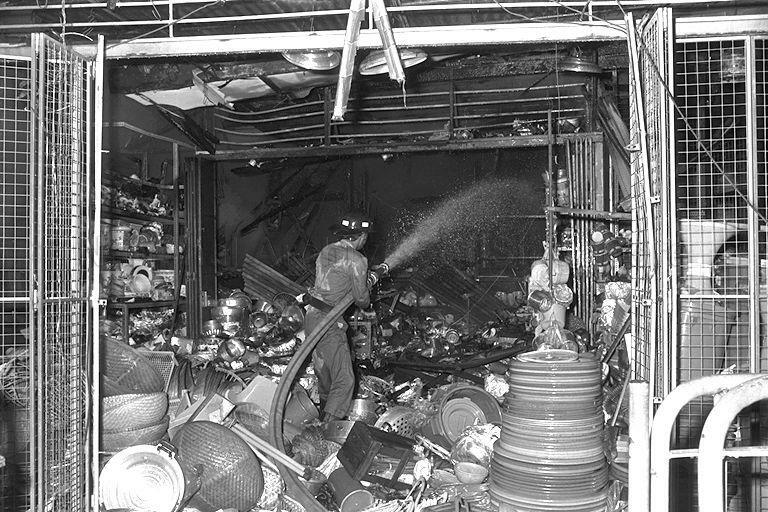 FIRE ROARED THROUGH NINE SHOPS AT THE BEAUTY WORLD PARK IN BUKIT TIMAH JUST AFTER 1.20 AM, DESTROYING GOODS AND PROPERTY WORTH OVER $200,000. THE GUTTED SHOPS DEALT IN TEXTILES, RADIOS, POULTRY AND INCLUDED TWO COFFEESHOPS AND EATING STALLS. THE CAUSE OF THE FIRE HAS NOT YET BEEN ESTABLISHED.